Kitchen planning can be overwhelming, with all of the material choices, layout options and budget consideration to keep in mind. Universal design ideas can help ensure that you’re adding function to your kitchen for everyone living in your home, regardless of age, size or ability. Universal lighting design concepts can improve your kitchen’s functionality when. You can increase natural light by adding a window or increasing the size of an existing window. The addition of a garden door can also be a great way to increase the natural light coming into your kitchen. You may want to consider layering different types of lighting in your space to get lighting where its needed. For instance, adding under-cabinet lights to your design will provide good lighting when you are preparing food. General or ambient lighting can be achieved with pot lights or other ceiling fixtures. Having flexibility on how bright the lights can be, will you give you control over the mood you wish to set. Our philosophy for lighting a kitchen is to “over-light” the space and use dimmers to achieve the necessary amount of light for the tasks at hand. Another universal design idea to consider is varying the heights of your work surfaces. Some tasks, such as kneading bread or mixing cookie dough, might feel more comfortable with a lower working surface while other tasks, such as rolling pastry dough or prepping vegetables are more comfortably performed at the standard counter height. If you have several people using the kitchen in your home, you may find that each one has their own preferences for work surface heights. 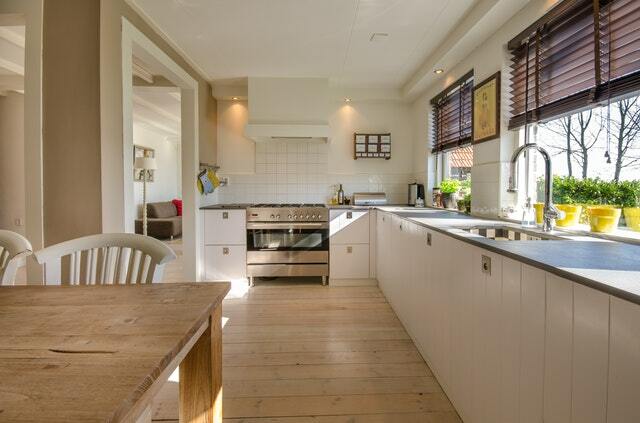 A higher counter top could be considered for islands and peninsulas as a leaning or serving surface. A raised bar top can provide a separation between work zones and leisure/eating zones. The type of materials you select for your renovation will also affect the functionality and comfort of your kitchen. Universal design promotes the use of safe, easy to clean and non-reflective surfaces. Hard surfaces like stone and tile can reflect light into your eyes and bounce sound around making your kitchen loud. You could consider using a laminate, wood or acyrilic counter top as these materials absorb the sound of dishes landing on the surface better than a harder surface like granite or quartz. 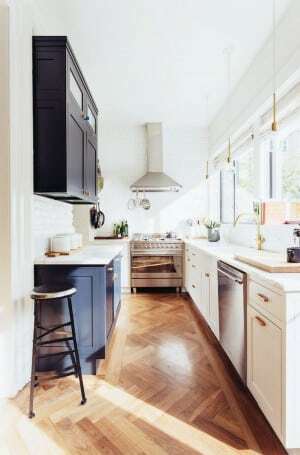 Another idea is to run hardwood throughout the main floor into the kitchen as it can be kinder to your feet and back when standing for long periods. Vinyl tile, vinyl plank and cork are other options for flooring materials that are softer on your feet, dampen sound and are easy to clean and maintain. Our designers would be happy to discuss your next project and show you how you can incorporate these ideas and more into your space. Contact us to talk more about universal kitchen designs.